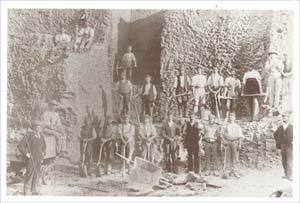 On the morning of Saturday, October 24th, 1908, Charles David Griffin, a young labourer of Weathercock Lane, Woburn Sands, and five other men were helping to remove the ballast earth that was heaped over one of the brick kilns at Eastwood’s Brickworks, by the station in Woburn Sands. This earth was piled up on top of the kiln helped to insulate it whilst firing the bricks. It needed to be removed so that the kiln could be repaired. “Woburn Sands. Terrible Accident. Kiln Roof Gives Way. Young Man Partly Buried in Hot Ballast. Heroic Conduct of a Fellow Workman. The Woburn Sands brickworks were on Saturday morning the scene of a terrible accident, in which a young man named Charles Griffin met with Injuries of a shocking character. On the previous day, one of the large brick-burning kilns had been emptied of its finished contents, and as the management had decided to repair the domed roof, it was necessary to clear from the top a large quantity of what is known in the trade as ballast, being brick earth placed on the top for the purpose of keeping the heat in the kiln. During the pro­cess of burning this ballast gets red hot, and retains its heat for a long time; consequently on Saturday it was intensely hot. The unfortunate young man, Griffin, who is about, twenty-six years of age, was engaged with five others in removing the ballast, when the part of the roof on which he was standing gave way, and he was precipitated into the empty kiln, with the hot ballast falling round him. Fortunately he fell on his feet, but such a huge quantity of stuff fell with him, that he was imprisoned up to his waist and held as in a vice. What his sufferings were it is impossible to imagine, but those who were near say his cries for help were heartrending in their agony. Word soon went round the yard that a terrible accident had happened, and scores rushed to the spot anxious to help in the work of rescue. This was rendered extremely difficult owing to the heat, with the fact that there was only an aperture large enough to admit one at a time, while the air was so impregnated with dust that very little could be seen. A young man named George Smith went down and dug away from the imprisoned man the calcined earth. When it had been got away, the victim was removed from his terrible position with as much care as the circum­stances would permit, and driven in a cab to Dr. Brander’s surgery, where he was speedily attended to. The Doctor’s examination revealed terrible injuries. Practically the whole of the skin was burnt from both legs up to the waist, while the skin of the arms was also burnt away. The body was uninjured, but two nasty cuts were received on the head from falling bricks. As soon as possible the unfortunate young man was removed to the hospital at Woburn, where further attention was given him. During the whole of this terrible experience, he remained conscious, and bore the excru­ciating agony with great fortitude. The report received from the hospital on Sunday was to the effect that he was going on as well as circumstances would permit, although, of course, it was too early to say what hopes there were of ultimate recovery. The action of the young man Smith in rescuing the imprisoned sufferer is beyond all praise. He cheerfully faced what was an exceedingly dangerous task, and it is to be hoped his heroic conduct will be suitably recognised. To be underneath a roof which had been proved unsafe, with some tons, of red hot earth on top which at any moment might come crashing down on him, was calculated to test to the utmost his pluck. “The industrial history of our country would, if it was inquired into, reveal many acts of gallant heroism, in which men, and women too, have cheerfully risked life and limb to succour a comrade or a friend. Fortunately, not many of those who are entitled to hold a place in the roll of industrial heroes have been called upon to make the great sacrifice which they have so unselfishly offered, but whether or not they have paid forfeit for their bravery with their lives, they nevertheless deserve honour of all men and women. Surrounded by the glamour and excitement of war, nerveless men are been spurred to do deeds of daring which seem well-nigh incredible. But this incentive action is wanting in the case of those who, with intrepid daring, deliberately, and with full knowledge of the risk they run, offer their own lives in an effort to save others. Such are he industrial heroes of England. Above we give a portrait of George Henry Smith, who, on Saturday week, performed a deed of heroism which compelled the admira­tion of all who were cognisant of the facts. As recorded in our last issue, Charles Griffin, an employee at the Woburn Sands Brick Works of Messrs. Eastwood and Co., Limited, was precipitated into the bottom of a kiln through the roof collapsing, and buried up to his waist in red hot ballast. Smith immediately went to the assistance of his workmate, making his way to him by means of the wicket, an opening through which the bricks are taken into, and removed from, the kiln. Ordinarily the wicket would have afforded ample space through which to pass into the chamber, but when the barrow which Griffin was wheeling fell down, it almost completely blocked up the opening, and was held in place by so large a quantity of brickwork and ballast, that it could not be shifted, Smith having to force his way through an opening scarcely a foot across. Realising the gravity of the task he was undertaking, Smith remarked to a fellow worker, “It means either one being rescued or two being buried.” And with that resolve he bravely entered on his task. The ordeal which the brave fellow went through can scarcely be imagined. But some idea may be had by realising a small chamber, perhaps eighteen feet by twenty feet, with a roof loaded with many tons of hot ballast, oscillating ominously, and threatening at any moment to precipitate its deadly load on the two young men beneath, one working feverishly to release his imprisoned friend, the other giving expression to heartrending cries as the hot earth seared his flesh. The rescuer’s task was much impeded by reason of the intense heat, the choking dust, and the poisonous gases which emanated from the chamber’s contents. When at last the work was completed, and Griffin was lifted out, followed by his rescuer, a sigh of intense relief went up from the hearts of those who had been silently watching the place where such a heroic struggle had been waged with death. From the time that Smith entered the kiln to the time the rescue was effected was about a quarter of an hour, but it took a long time for him to recover from the effects of his most trying experience. George Smith, who celebrated his 23rd birthday on Thursday, was born at Farcet, near Peterborough, and has been engaged during the whole of his working life in the brick making industry, at present assisting his father, who is a brickburner. He is above medium height, somewhat sturdily built, and possessed of much muscular strength. Of a modest and retiring disposition, he seemed loath to discuss his brave deed when interviewed by our correspondent. When asked if he could describe his experiences while underneath the shaking roof, he replied that he had no time in which to think of anything but the task which he had set himself. He was prepared, however, to do the same again, should circumstances demand it. 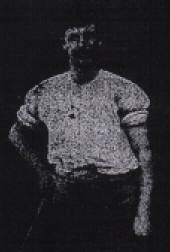 Mr. Mason, the works manager, described Smith’s conduct as heroic. The oscillation of the roof was so pronounced that he felt sure had a train passed by at the time the two were underneath, the whole of it must have collapsed. We are indebted to Mr. Mason for his courtesy in giving facilities for the taking of the photo, which shows the wicket of the kiln next to the one which collapsed. Woburn Sands. The Brick Kiln Fatality. Death of Griffin. Evidence at the Inquest. [by Telephone.] The inquest on the body of Charles Griffin, who sustained injuries it the Brick Kilns, Woburn Sands, on October 24th, was held at the Weathercock Inn, by Mr. F. T. Tanqneray, Coroner, on Monday (yesterday) morning. Mr. Miller was elected Foreman of the jury. Mr. Leonard Ward, Inspector of Factories, from the Home Office, was among those present. The jury viewed the body and afterwards went to the works and inspected the kilns. The first witness was Annie Griffin, mother of deceased, who said his age was twenty-eight. He was not insured, and was not a member of any club. Alfred Mason, manager of Messrs. Eastwood and Co., Ltd’s., brick works, said that when he discovered the kiln was unsafe he gave instructions for the roof to be cleared and the middle wall to be supported with heavy timbers, also the chambers on either side of the one which gave way. There were four other men beside the deceased on the roof, who worked with pick and shovel, loading the ballast into the barrow which. Griffin wheeled. About 9.20 he was called up and found part of the arch at the front had col­lapsed and Griffin had gone down. He went up and saw George Smith inside uncovering Griffin’s legs. Griffin was ultimately got out and taken to Dr. Brander. Mr. Mason, in reply to Mr. Ward, stated that direct instructions had not been given to have the whole of the roof shored up. He had a dry brick pillar put underneath the weak spot about a month before the accident happened. The kiln had been fired since, which would farther tend to weaken the roof. Witness could not say what was the average life of a chamber. David Griffin, cousin of deceased, said he had charge of the gang who had been engaged to clear the ballast away. He deposed to re­ceiving instructions from Mr. Mason, and he was told not to go on the end which was weak until made secure. About eight o’clock in the morning the bricklayer, Whitlock, came and said it was all right, and they could get on with the work. His opinion was that the roof of the chamber was totally unsafe, and that the work should not have started until made secure. In reply to Mr. Ward, Griffin said Mr. Mason told him not to go on the weak spot, as it was dangerous. Soon after eight o’clock Whitlock, the bricklayer, came up and told him that it was safe, and they could get on with the work. William Whitlock, the bricklayer, was the next witness. He said he had examined the arch which gave way, and found one weak spot about four or five feet from the wicket. A brick pier had been put up to strengthen it. The arch had sunk in the shoulder. The same morning he was working under the arch to timber the wall up, and finished at 8.20. He gave instructions to the men on the top not to go on the weak spot. He did not tell them at any time that they might go on, neither did he hear Mr. Mason say that they were to wait for his (Whitlock’s) instructions. Mr. Mason had not given him any directions to see that the roof was safe. He told the men not to go on the weak places, but if they could not clear it any other way it was to be knocked in. David Griffin was the one he told not to go on. He did not tell Griffin it was safe. James Knight gave evidence. Walter Pointon and William Alfred Fisher who were working on top, next gave evidence. George Henry Smith, who rescued the deceased, also gave evidence. Dr. Brander gave evidence concerning the injuries to the deceased. The Coroner summed up, and after some deliberation the jury returned a verdict of “Accidental Death,” and expressed the opinion that precautions ought to have been taken to shore the roof up before work commenced. The Jury expressed admiration at Smith’s conduct in rescuing the deceased man. Death of Griffin. The unfortunate young fellow Griffin, who was so terribly injured by the recent accident at Messrs. Eastwood’s brickworks, died in the Woburn Hospital on Friday morning. Needless to say, a large amount of sympathy has gone out to the deceased young man’s mother and sisters, while sympathy has also been expressed with Messrs. Eastwood, who are recognised as good employers. The Smith Testimonial. A public meeting as held in The Woburn Sands Parish Room on Friday evening in connection with the G. H. Smith testimonial fund, the Rev. D. W. Henry in the chair. It was resolved that the fund remain open until Saturday, Nov. 21st, and the following were appointed a committee to administer it: The Rev. D. W. Henry (Chairman), Dr. Holmes (Treasurer), Messrs. Harrington, Hill, Ellingham, Boyes, and Garrod, with S. J. Southwood as Secretary. On February 27th, 1909, Smith went to Marlborough House to be presented to The Prince Of Wales, president of the Royal Humane Society. Admiral Sir George Digby Morent (deputy chairman of the RHS) described how there had been five silver medals awarded for 1908, but the committee had unanimously decided that the Stanhope Medal should go to Smith. This Gold Medal was accompanied by a £5 gift. The Prince of Wales told Smith he was “exceedingly pleased to meet such a brave man, and hoped he would live long to wear his medals and feel proud of an act of bravery which was of no ordinary character.” Sir William Bull M.P. thanked the Prince on behalf of the Society. But this was not the end of the recognition of Smith’s act of bravery. On 22nd July, 1909, Smith went to Buckingham Palace to be awarded ‘The Albert Medal’ 2nd Class, by King Edward VII. 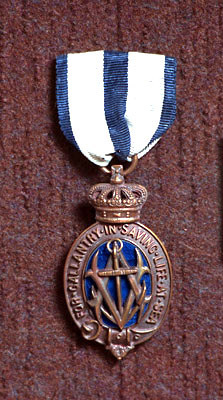 This is a bronze medal with crimson enameling, and is one of the top civilian awards for gallantry in saving, or attempting to save, life this country offers. Charles David Griffin was born in 1880 to David and Annie, who had married in Woburn Sands in 1878. David was an agricultural labourer and Annie was listed as a hat sewer. He was the second of five children, and was living in Aspley Hill at the time of the 1891 Census. George Henry Smith was born in 1886, in Farcet, just south of Peterborough. 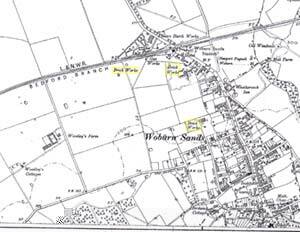 By 1901, his parents had moved to Woburn Sands, and were living at The Leys Farm, where his father was the farm foreman. 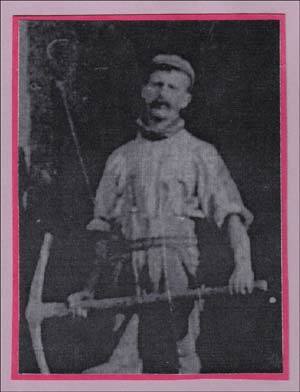 George was their oldest surviving son, and had already started work as a brickyard labourer by the age of 15. There were also brickyards operated at Farcet. The information about the accident and award of medals comes from many sources; The Times, The London Gazette, The Beds Times, The Bucks Standard, The Wolverton Express and The North Bucks Times and County Observer. The story was probably covered by the Woburn Reporter, but the editions from those years have not survived. A previous owner of the medals had difficulty in finding out who owned the medals before him, although they came with a copy of the citation, which had been requested in 1973. There is also a picture, supposedly of Smith, which is part of a larger picture of all the Eastwoods employees, which has been published in the book “Wavendon As It Was”. The names of several of these men are recorded in that book, but Smith is not amongst them. 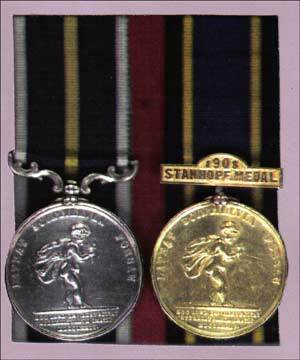 Footnote: Only six A.M., Stanhope Gold Medal combinations have been awarded, the above described one being unique since all of the other A.Ms were for services at sea. Ex Spink 29 March 1994 (Lot 1024). If the new owner of the medals is reading this, I would very much like to get in contact and possibly take some better pictures!